Captain to Face Leeds United? Birmingham City captain Stephen Carr is back in first team contention for the Leeds United game tomorrow after recovering from his knee injury. Carr has been sidelined since mid-December, missing Blues last nine games in the league and cup. The Blues captain was ably deputised by Jonathon Spector during his absence and Birmingham City boss, Chris Hughton cannot give Carr a guarantee that he will slot straight back into the first team. 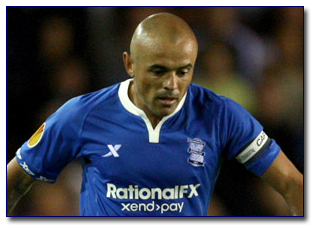 Speaking to bcfc.com, Hughton said: “Carr is fit again and is in the squad. “But there are no guarantees on anybody (coming straight back in). “We have got a competitive squad at the moment and that’s what we’re striving for, to have that competition. Blues may be without the services of Marlon King against Leeds, who is still suffering with a groin strain. Guirane N’Daw is also unlikely to feature in the game, as he flies back from the Africa Cup of Nations, but want away defender, Liam Ridgewell is available for selection. “We’re still endeavouring to get N’Daw back, but at this particular moment it doesn’t look like we will,” Hughton added. “But he will certainly be available for the weekend. “Ridgewell is fit and available and Marlon will be touch and go. When quizzed over the likelihood of Adam Rooney keeping his place after his brace at the weekend, Hughton replied: “There is always a tendency with players that if they are playing well to continue with them. “But you have to look at every game on its merit. “Sometimes it’s about form, sometimes it’s about trying to pick the right team for a particular game, whether it’s home or away, or just down to the opposition. “Adam did very well and scored two very good goals. This entry was posted in BCFC News and tagged bcfc, birmingham city, birmingham city football club, championship football, chris hughton, leeds united, stephen carr. Bookmark the permalink.